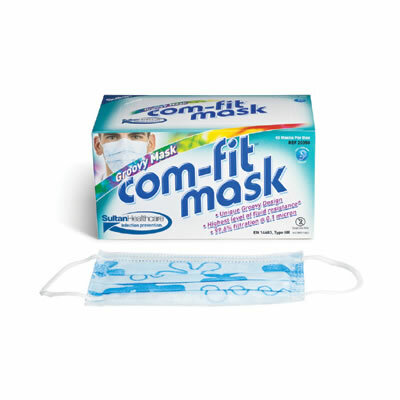 The COM-FIT Groovy Mask from Sultan Healthcare offers protection with a 'groovy' look that appeals to both practitioners and patients. The Groovy Mask features the highest level of fluid resistance to provide protection against blood, aerosols, and body fluids. A 99.6% particulate filtration at 0.1 'm ensures a high level of protection against bacteria, viruses, and microscopic particles.